Started dating Barry in 1975 and became Mrs Sheene in 1984. Mother of his children, Freddie and Sidonie. Met Sheene in 1975 and would become his best mate and also his team-mate for the 1977 season. 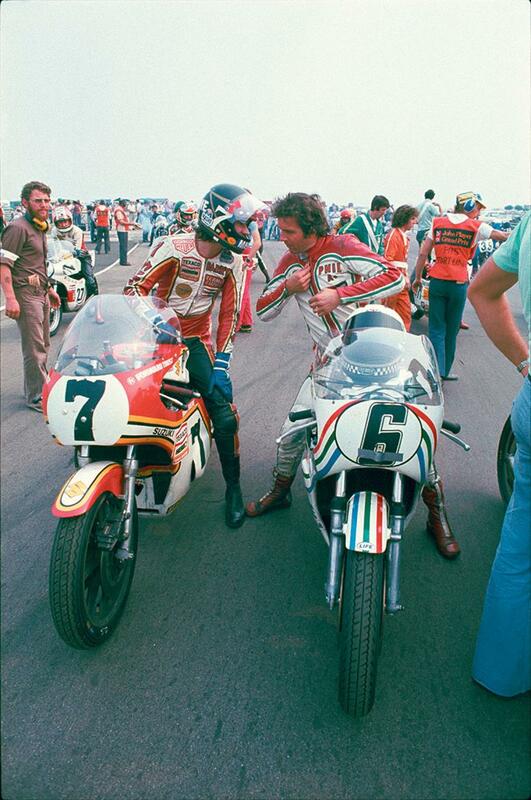 American brothers who took the fight to Sheene in 1976 – Pat as rider and Chip as his right-hand man. 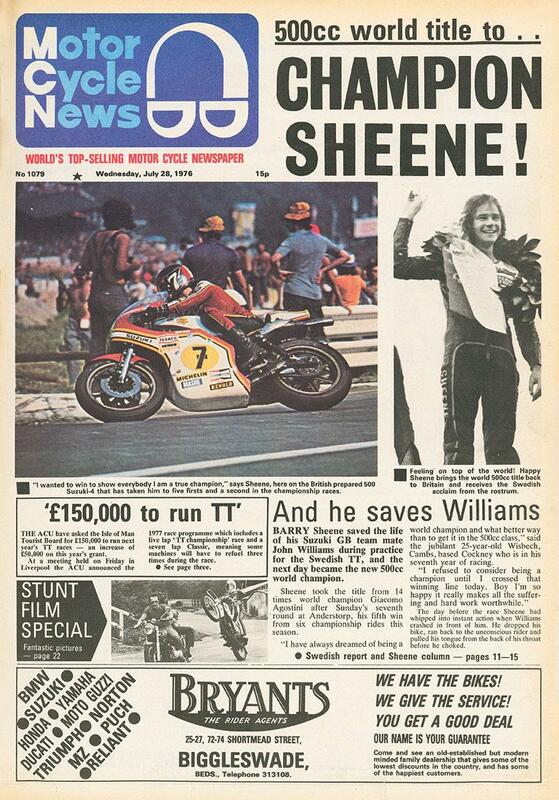 Was 11 years old in 1976 and obsessed with Barry Sheene. He is now a respected motorcycle journalist. Stephanie Sheene: 1976 was a great year for us - one of the best. I can’t believe it’s 40 years ago! It was our first year together and also the first year that he looked like he could win the championship so there was a lot of attention. Steve Parrish: ITV’s televised documentary that included Barry’s big crash at Daytona had already made him a huge star in the UK by 1976. But he was also hugely popular because of all the girls and the Rolls Royces and all the other things that bikers didn’t normally do. Alan Seeley: 1976 was an age of heroes. We had Evel Knievel, James Hunt and Barry Sheene so it was a brilliant time to be a schoolboy! Between Knievel and Sheene, how could you NOT be interested in motorbikes? SS: Barry was still having physio at the end of 1975 to treat the injuries he received at Daytona that year, but by the start of the 1976 season, he was fine, although I think his knee was always a bit of a worry after Daytona. But after taking his first few wins in ’76, Barry became very confident that he could win the world title. 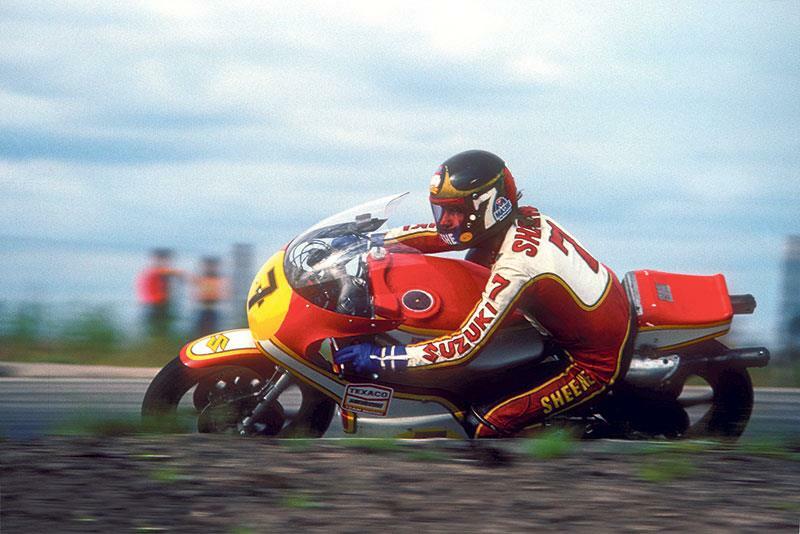 SP: Barry was favourite for the title that year simply because the Suzuki RG500 was so good. When it first came out it was hugely fast but a bit unreliable but it was obvious that Suzuki would make it reliable. With the four-strokes having come to an end, it was the bike to have, and Barry was the number one rider in the Suzuki factory team. Chip Hennen: In 1976 Pat and I watched Barry very, very closely on and off the track and listened to his every utterance to learn what we could from him, and we learned quite a lot. I’m sure that’s part of what made Barry so nervous about Pat. AS: Of course, you couldn’t watch the races on TV because they weren’t shown so we had to read about them in Motorcycle News. You’d get news stories on the radio and TV though, telling you how Sheene had done. SS: Paddock life wasn’t as glamorous as people might think. At first I was just sitting around in paddocks that had very few amenities so it took a bit of getting used to. At least we didn’t have to stay in the paddock though – we always stayed in hotels. And we travelled around in Barry’s Rolls Royce, which was nice! SP: Barry was a brilliant rider and won the first three races of the season but I think his biggest talent was in getting the troops behind him. He was great at getting all the mechanics – even the Japanese ones – behind him. The tyre people loved him, the chain people loved him, the spark plug people loved him – everybody loved Barry Sheene so he had the whole paddock pushing him along. Technically, he was very good too. He could take an RG500 – or any bike for that matter – to bits and put it back together again. PH: I wasn’t really friends with Barry but, looking back, to be honest, part of how racers become really good racers is by being very focused, to the point of not really developing close friendships with many people around you. SS: At first I didn’t really think of the dangers when Barry was out on track. But then people were falling off, left, right, and centre, and people were actually getting killed so that’s when I realised how serious it was. But then I got into the timekeeping thing and once I did that it took my mind off being nervous and gave me something to concentrate on. I remember some of the wives and girlfriends being absolutely terrified but, even though I’m a bit of a worrywart by nature, for some reason it didn’t bother me too much. SP: As the world title got closer, there were more people wanting his autograph, more people wearing number 7 T-shirts. He was someone that people were just attracted to – he was a great hero. But I also understood the frustration of the other riders. I’d beat Barry at Scarborough or wherever and people would still just push me out of the way to get to him! So I worked out the best thing to do was be in the same garage as Barry and just get in his slipstream! CH: The PR firm of Andrew Mariott and Barry Gill had a lot to do with shaping Barry’s public image and how he presented himself to the media and the public. We had gotten to know both of them over the season and watched how influential they were with Barry in those areas. They did things like help Barry prepare “canned” responses to the various questions the press asked him. They tended to always ask him the same questions and Pat and I noticed that Barry’s responses were always the same. Mariott and Gill also helped arrange things like TV and radio appearances and were, in my opinion, two of the best racing PR people I’ve ever known. SP: Even as the championship closed in, Barry kept partying because it didn’t make any difference. There were no riders back then who said, “Well, I’m going to go to the gym and take it serious.” Pat Hennen was a little bit like that because he was American, and he hated it that Barry could party hard, avoid the gym, and still beat him. But by 1978 Barry realised he had to start training because Pat had started beating him! PH: I don’t know what Barry really thought of me, or whether he was ever really concerned about me as a rider. SS: Even if things were going bad at the track, Barry was never miserable at home. I know some of the other racers took things out on their wives but he wasn’t like that. I think he knew nothing was going to take it away from him that year. SP: Barry rode great that year but I don’t think he had a radically different style to anyone else. He had gangly, skinny legs that stuck out a lot but I don’t think he came along and changed the way of riding a Grand Prix bike because people were already hanging off them. And he was mechanically sympathetic because he understood engines. He was a good all-round rider; he wasn’t mad on the brakes or radical in any one area - he was just a really good, smooth rider. AS: Sheene finally wrapped up the title at the seventh round in Sweden – although he’d sat out the TT which was still the British round in 1976. 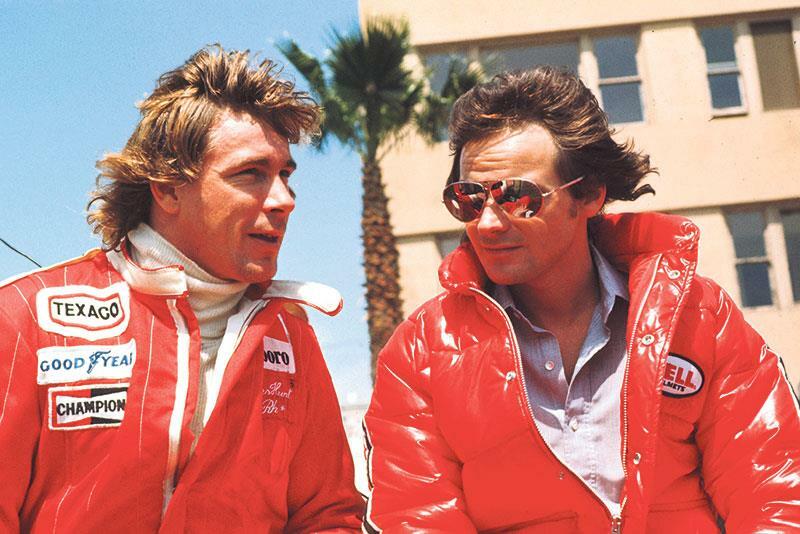 So we had two British world champions that year – James Hunt and Barry Sheene, and that seemed very special. It was a magical time. Motorcycling was still viewed as a pretty dangerous pursuit but Sheene somehow made it acceptable. SS: The Swedish GP was just like any other race really. Because there were plenty more races left that season, he wasn’t too worried about trying to wrap the title up. He was just lucky that he did – because then he didn’t have to go to any more races to make sure of it! Afterwards, we just went back to the hotel. Of course, everyone was congratulating him and stuff, but it was just like he’d won another race – except he’d won the world championship as well. We had dinner at the hotel as normal, had a few drinks as normal, and then just went to bed and went home in the morning – very happy! Forrester’s house (an aristocratic friend of Sheene’s who once dated Princess Anne) in Chelsea. Gary Nixon turned up, I think Johnny Cecotto was there, and obviously there were lots of girls too. But we had so many parties that, to celebrate his title, we just probably got that bit more pissed and had more girls! SS: He wasn’t any different at all after wining the title - he just wanted to do it again the following year! So there was a bit of added pressure in 1977 because everyone expected him to do it again too. Barry’s title-winning bike from 1976 sits in the house here and his medal for winning the title is here too.